James was the middle son of the famous Joseph Lang Snr and managed his father's gunmaking company until its sale in 1886. 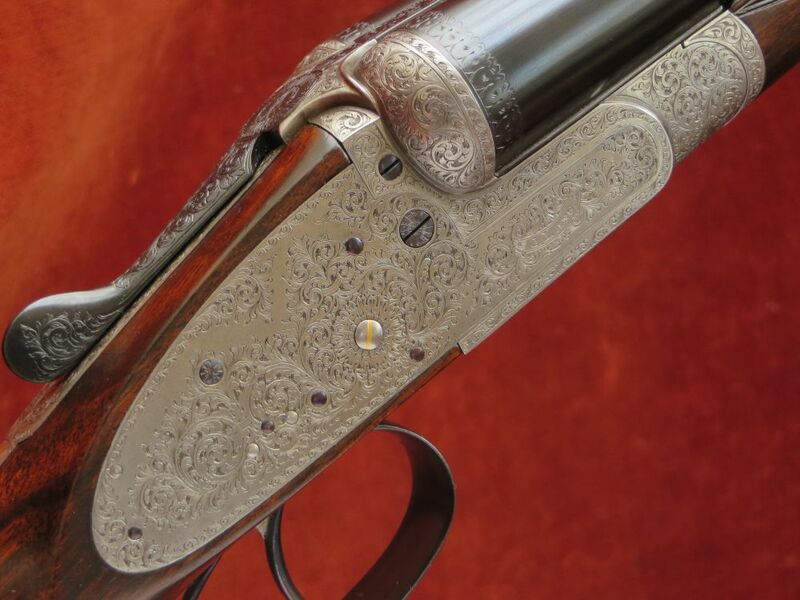 He then went on to run his own gunmaking concern, producing a relatively small number of beautifully finished guns of all types and specifications. 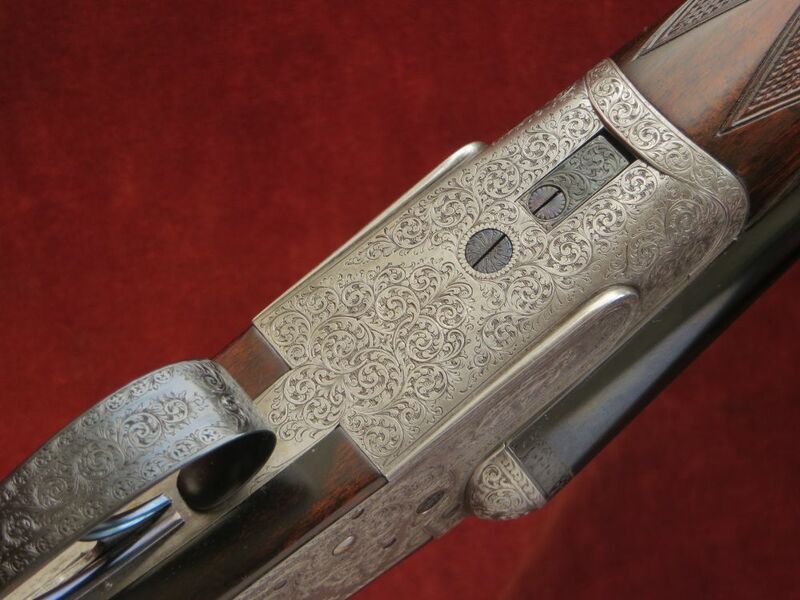 Built with 9 pin, back action bar locks by Thomas Southgate, a highly respected London gunmaker, this gun is a very fine example of James's work and exhibits many features commonly found on full, bar action sidelocks from the most illustrious gunmakers. 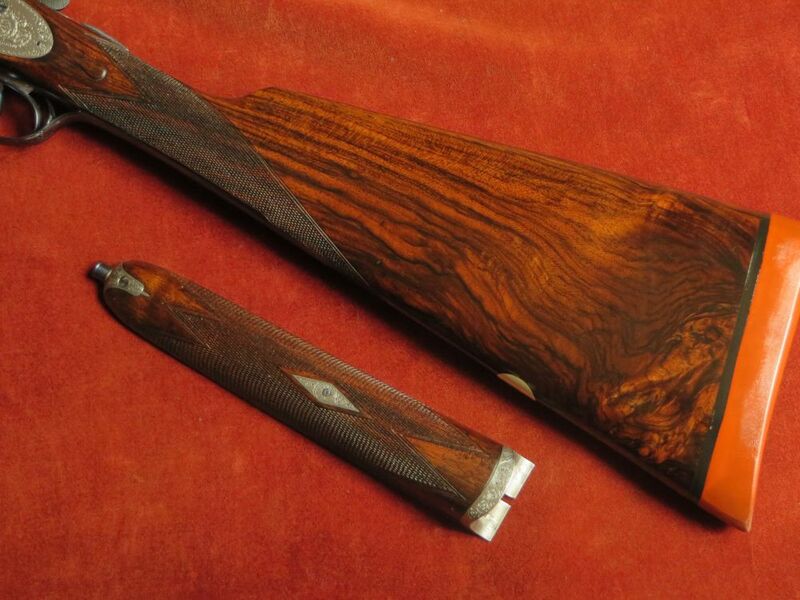 The original damascus barrels were beautifully sleeved by Joseph Lang & Son in 1985 and reproofed for 2 3/4" nitro cartridges and the highly figured original stock and forend are in fantastic condition for their age. 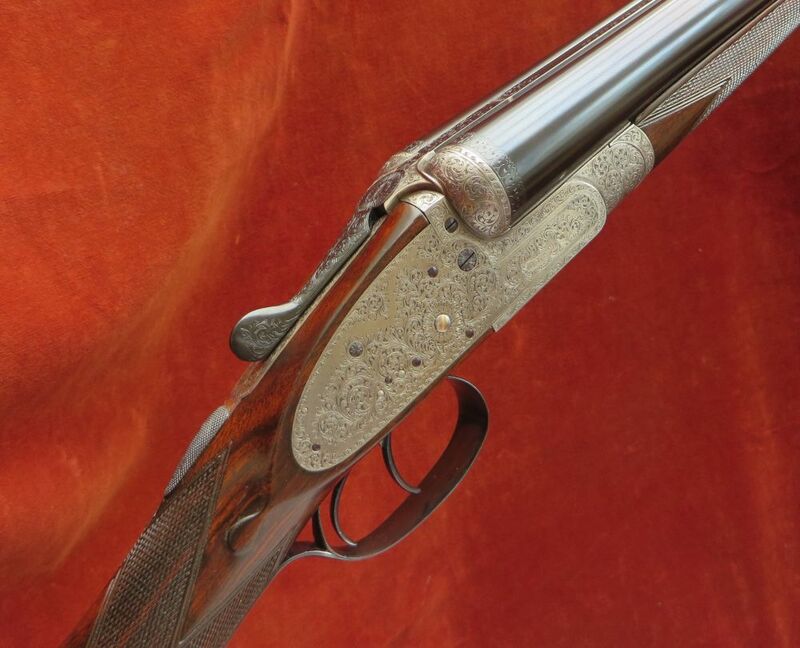 This all adds up to a beautiful and strong gun that is a joy to shoot and should give many years of service on game or clays with normal maintenance. Engraving style Finely chiselled, beaded fences. Best Bold Foliate Scroll. Gold inlaid SAFE. Barrels Engraved 'JOSEPH LANG & SON. 102 NEW BOND STREET. LONDON'. Action bar engraved 'J LANG' in a banner. Trigger pulls measure approximately: Front trigger 3 lbs Rear trigger 4 1/4 lbs. The sleeved steel to damascus barrels are 28" in length, chambered for 2 3/4" (70mm) cartridges and are of brazed dovetail lump construction with soft soldered ribs. London reproof for 70mm nitro powder cartridges in 1985. 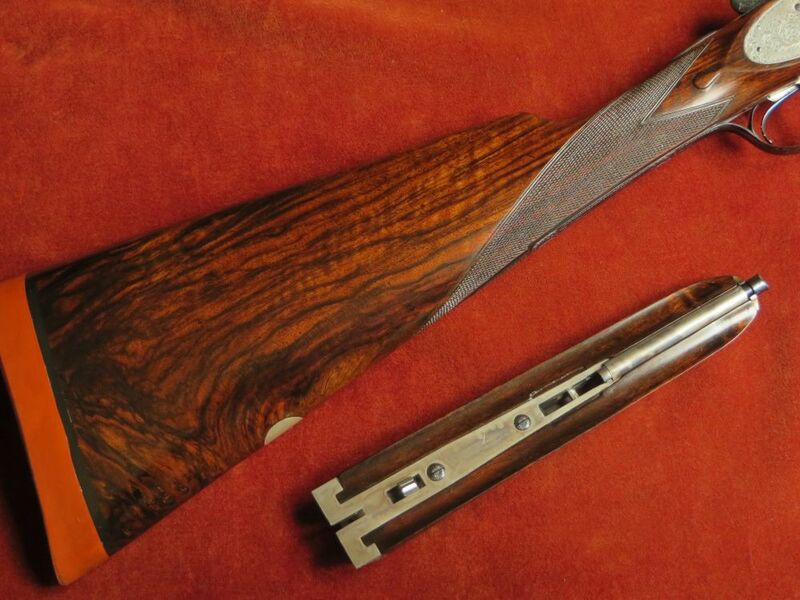 Straight Hand Stock and Splinter Forend are crafted from very highly figured walnut. 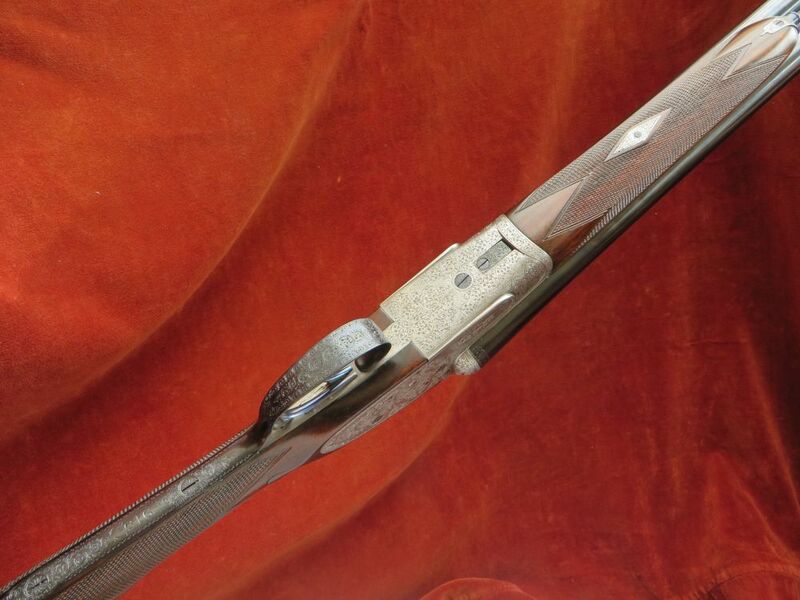 The stock is lightly cast-off for a right-handed shot, features a vacant white metal oval, well-defined drop points and a 1" Silvers recoil pad. 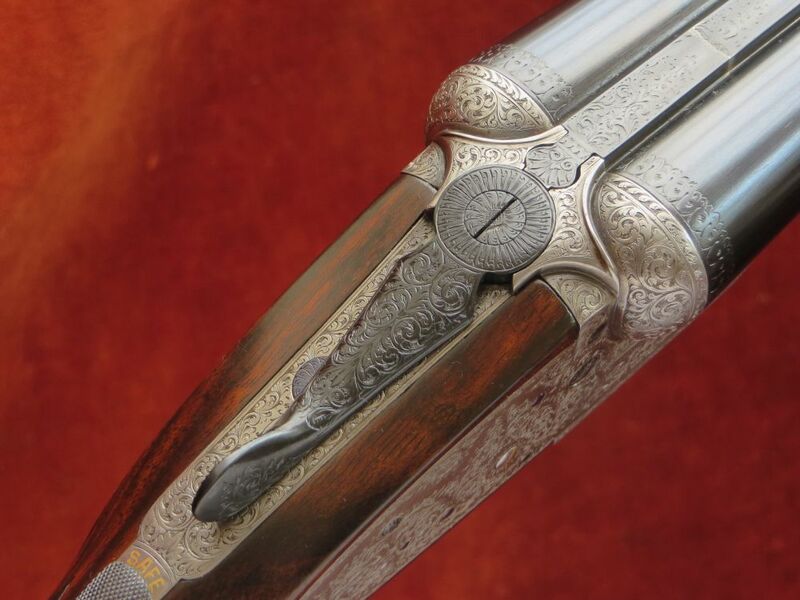 The forend features a finely engraved forend tip and diamond. The 24 lines per inch chequering has been freshened to a normal sidelock pattern. Anson forend fastener patent no. 3791 of 1872.